After Wu Lihong and I visited Xiao Zongyou and his wife, we decided to visit Wu Guofeng’s (吴国锋) parents, Wu Dingfu (吴定富) and his wife, who live in the suburbs of Chengdu in Xinjin County, Wujin Township. The drive from Chengdu to Xinjin County is actually not that far. We did the driving ourselves, and it took a little more than an hour. The Wus’ original home was demolished in the late 1990s, so they bought a new place. Their current home has three bedrooms and a living room. The furnishings were simple, but the place was kept very clean and tidy by Mrs. Wu. As soon as we came through the door, we saw a photo of their son, Wu Guofeng, hanging on the wall. This small shrine is where the parents communicate with their son’s spirit. Wu Dingfu, 70, is a retired worker of a concrete factory in Xinjin County. His wife, Song Xiuling, 67 years old, does not have a formal job. She once operated a small shop outside their home. After their home was demolished, the store was gone too. The couple has three children. The eldest is their daughter, who lives in Wuhan. (This daughter’s child already has a 4-year-old daughter—so the Wus have become great grandparents.) Next they had two boys. 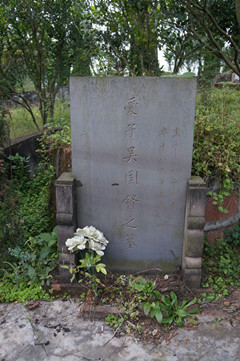 The second child was Wu Guofeng. The youngest, Wu Guobin, passed away in September 2001 due to untreatable uremia. Wu Guobin’s wife remarried and does not keep in touch with them but she left behind the daughter she and Wu Guobin had. That daughter now lives with Wu Dingfu and his wife and is in middle school. Wu Dingfu and Song Xiuling, parents of Wu Guofeng. The following is an edited transcript of our conversation with Wu Dingfu and his wife, with our description of what we know about Wu Guofeng’s death. Wu Dingfu: “He was in the industrial economics department of Renmin University. That year he was 21 years old—well, just one month shy of 21. His birthday was July 3. He was a junior in college. Wu Dingfu: “He didn’t work hard, but he was smart. As for studying, you could say he had a photographic memory. He looked at something once and knew it. After the letter was sent, Wu Guofeng never responded. His parents understood their son did not agree with them. The only thing they could do was follow the developments of the student movement in Beijing from where they were, and worry about their son. Wu Dingfu: “It was not the school that notified us. The school authorities notified the provincial authorities, who notified the county authorities. The county authorities notified the town government, who then notified us. “One day later, we bought our tickets to Beijing. The school arranged for a deputy Party branch secretary Zhang and a few students to come meet us and settle us in a guest house. As we had arrived relatively late, the school did not meet with us right away, but let us rest. The second day, the school finally spoke with us about Wu Guofeng and told us what had happened to him. “This was what we learned: the night before Guofeng died, the teacher in charge of Wu’s class, the department head, and the deputy Party secretary in the department came to the student recreation room and told the students not to go out, that the troops had already opened fire to end the demonstrations. They told the students that they could even stay in their dorms and learn to play mahjong. As soon as the teachers left, Wu Guofeng walked his bike off campus, carrying his camera. He said he wanted to go where things were happening and see with his own eyes. “Also, a classmate of Wu Guofeng, called Li Xuedong, whose parents worked at the Chinese Academy of Social Sciences, kept us company while we were in Beijing and told us a lot about what was happening with Guofeng. He said that that Guofeng joined the marches from the beginning of the student movement, and that he went on hunger strike for five days in Tiananmen Square. He also said Guofeng took a lot of photos, which were confiscated. In keeping with the Wus’ hometown custom, Wu Guofeng was dressed in a white shirt, white pants, and a white hat. The parents were devastated when they saw their son’s body at the Post and Telecommunications Hospital. It was covered from head to toe in blood, his head was encased in coagulated blood, his body had streaks of bloodstains running down it, and his eyes were open. The hospital used rubbing alcohol to clean the body. At Wu Dingfu’s request, they dressed Guofeng in a white shirt, pants, and hat. They held a small memorial ceremony at the hospital, and then sent the body to the Babaoshan crematorium to be cremated. Originally, the school did not want the parents to go to the Babaoshan crematorium for fear that they would be upset. But Wu Dingfu and his wife insisted on going, to see their son off on his final journey, watch the cremation with their own eyes, and carry their son’s ashes back with their own hands. After the cremation, they got his ashes in the afternoon, stayed that night in Beijing, and then returned to Sichuan the following day. Wu Dingfu: “It was the student organizing committee for activities to commemorate Hu Yaobang. Other schools established the Autonomous Federation of University Students. But at Renmin, they established this organizing committee. Based on the information we have gathered from various sources, the following was what happened. Wu Guofeng left the campus alone, walking his bike. When he was on West Chang’An Avenue in the Xidan neighborhood, he ran into the martial law troops who were coming in from the west, heading towards Tiananmen Square. He was taking photos when he was hit in the back of the head by a bullet and fell to the ground—but he had not died. A soldier came over to grab his camera from his hand, but Wu Guofeng would not give it to him. In the course of the struggle, Wu Guofeng was stabbed in his lower abdomen by the solider with a bayonet. There was a two-inch long cut. Wu Guofeng clenched the wound with both hands, and the palms of his hands had obvious blade marks. One can infer that he used the last bit of strength in his life to grab at the bayonet that stabbed him. Afterwards, an elderly person took him to the Post and Telecommunications Hospital. He died right after he told the elderly man his school. Wu Guofeng had a watch and a student ID card with him. The hospital filled out his death certificate based on the account by the elderly man and the information on the student ID card. 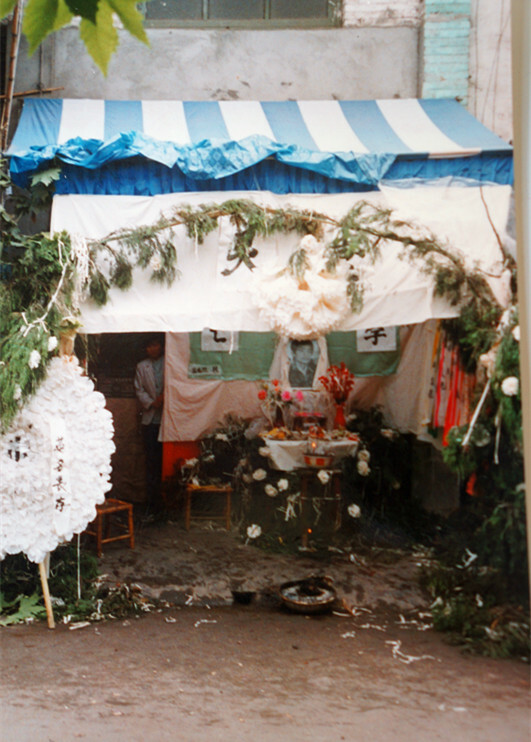 Shrine set up by Wu Guofeng’s parents in front of their shop. When Wu Dingfu and his wife came home, looking at their son’s ashes, they could not reconcile their feelings of resentment. They thought about their son, who had excelled in his studies. At every school in Xinjin County, from elementary school to middle school, he was always a student among the “three goods”: healthy, studious, and moral. 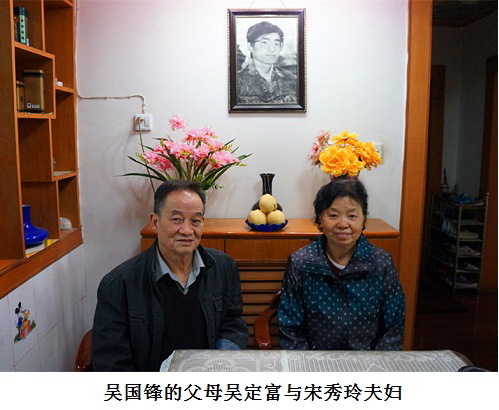 Three years earlier, their son had scored the highest in humanities in all of Xinjin County and tested into Beijing’s Renmin University of China. He became a sensation throughout the county—a lot of people knew his name. After talking it over, the couple decided that they had to let everyone in Xinjin County know that their son had been killed for no reason. So they set up a shrine in front of their small shop on Zhengdong Street in Wujin Township. If you go across the street from where Wu Dingfu and his wife live now and down an alley, you will come to the Minjiang River tributary, which passes through the entire Wujin town. Standing on the riverbank, you can see a stone bridge. On the other side of the stone bridge is the little mountain where the two brothers are buried. The mountain is full of trees, verdant and lush. On top of the mountain is a small pavilion. If you drive, it only takes just a little over 20 minutes to get there. 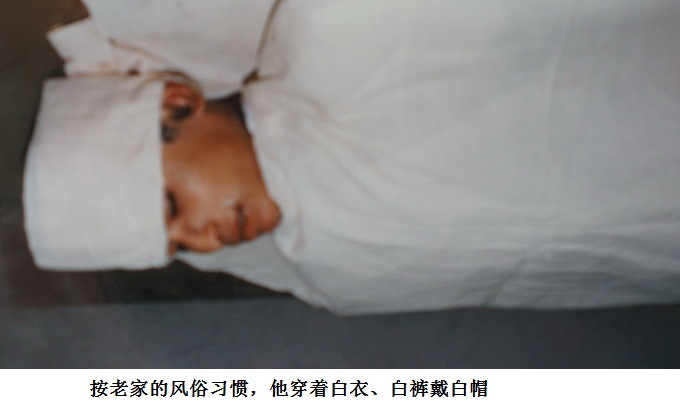 Editor’s note: Two additional photos of Wu Guofeng’s body, showing wounds on his body and face graphically, are available in the original Chinese version of this essay. The “Three Antis” was a campaign in 1951-52 that targeted corruption, waste, and bureaucratism within state bodies and state owned enterprises. Focused on private enterprises, the “Five Antis” was a political movement in 1952 against bribery, tax evasion, sloppy work, theft of state property and assets, and theft of state economic information. The Four Cleanups Movement in 1963 targeted politics, the economy, organization, and ideology. Ding Zilin is a founding member of the Tiananmen Mothers. Wu Guofeng (吴国锋), 20, a student of industrial economics at Renmin University of China, in the entering class of 1986. In the evening of June 3, 1989, he was shot in the back of the head when riding his bike and carrying his camera. After he fell to the ground, he was stabbed in the abdomen with a bayonet. He had blade marks in the palms of both hands. An elderly person took him to the Post and Telecommunications Hospital, where he died.